House Passat WE 04 - "MoinMoin" - House Passat WE 04 - "MoinMoin"
Apartment "MoinMoin" The kilometer-long natural sand beach of the cliff, the view of the Baltic Sea and the legendary Ghost Forest with the huge crooked trees are just a short walk from your apartment. You can find a couple, as a family with children or as seniors with grandchildren calm, rest and relaxation. A variety of activities nearby including golf, horse riding or cycling tours on offer. Lively Warnemünde can be reached in 8 km. Within walking distance from the sandy, guarded main beach of dreamy seaside resort, in a quiet, yet central location to enjoy the nature and environment of the first minute, even out of season. This unique holiday resort was built in 2015 individually in the style of classic seaside resorts architecture. Features The high-quality furnished 2-bedroom apartment (54sqm) on the ground floor offers with an accompanying parking space comfort and leaves nothing to be desired. The apartment can accommodate max. four persons. The "corner shop" is only 150m away. From the living area you have access zut terrace. The terrace is equipped with a table and four chairs for relaxing hours during your holiday. The living and dining area has a large and comfortable couch (with sleep function), a coffee table, and a dining table with four chairs. A flat-screen TV (48 inches), Blu-Ray player and a small stereo system are also provided. On cool autumn and winter days are in all rooms underfloor heating for warmth and comfort. The kitchen is top quality with dishwasher, refrigerator (with freezer), coffee maker, kettle, toaster, blender, dishes and cutlery, 4-burner stove equipped (ceramic) with oven and microwave. Furthermore, the apartment has a bedroom with a spacious wardrobe, flat screen TV. A double bed ensures a restful sleep. The bathroom is equipped with a floor-level walk-in shower, a large vanity, a wall mirror and a hair dryer. Pets not allowed This is a Non smoking apartment. Additional services In addition to building is a lockable storage room for bikes and prams available. Free Wi-Fi is available in the entire apartment. A travel cot and highchair are available for an additional fee. Linen and towels (towels & bedding) are chargeable to booking. Bike rental is possible in place. We wish you a relaxing vacation! The "Holiday Park Nienhagen" with its 27 exclusively designed holiday apartments in the style of resort architecture is between two famous seaside resorts: the 8 km from Warnemuende to the east and 5 km from Heiligendamm in the West. From "Holiday Park Nienhagen" to the beach is only about 400 meters - lure romantic walks in the sunset! But the Baltic coast holds also provides a wide range of sports and culture for you. Die moderne und noch recht neue Ferienwohnung hat uns überzeugt. Die Beschreibung stimmt perfekt, die Wohnung war gut ausgestattet und sehr sauber. Sie liegt an einer ruhigen Einbahnstraße nicht weit weg vom Strand. Ein Bäcker und ein Tante Emma-Laden liegen in unmittelbarer Nähe. Die Betreuung war professionell. Als wir abends um 21.00 Uhr den Notdienst der Wohnungsverwaltung benötigten, stand der Mitarbeiter 25 Minuten später vor der Tür. Vermisst haben wir nur eine dimmbare Stehlampe zum Fernsehen und Lesen. Die Wohnung ist sehr zu empfehlen. Sehr schöne Wohnung. Sehr gepflegt. Es ist eine wunderbare Ferienwohnung,man hat alles vorhanden. Trotz alledem ist die Wohnung Top. 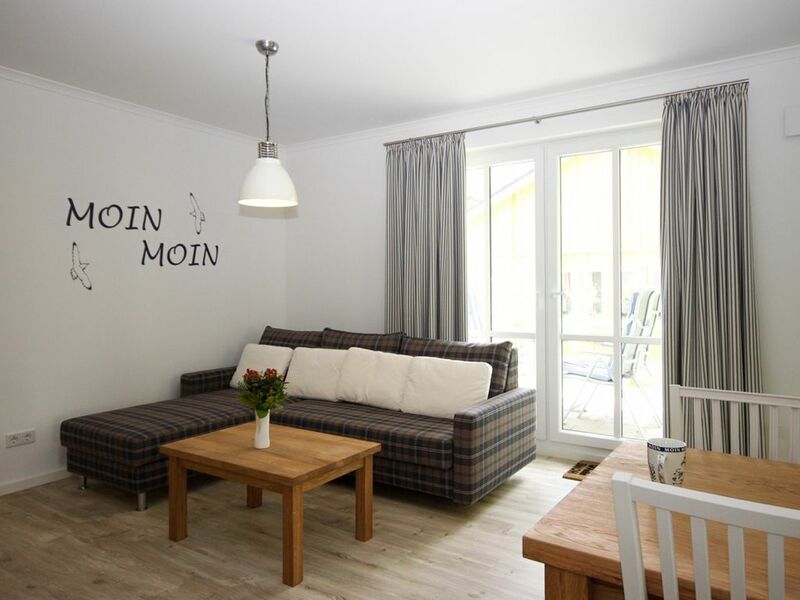 Sehr schön aufgeteilte und ansprechend eingerichtete Ferienwohnung. Alles ist geschmackvoll abgestimmt, es fehlt an nichts. Wir empfehlen diese Wohnung gerne weiter. The fine-grained approximately three kilometer long sandy beach is in Nienhagen harmoniously into the stunning, up to 12 meters high cliff. The Nienhagen is adjacent to the 180-hectare Gespensterwald with beautiful hiking trails and numerous ancient, crooked trees. The large, unspoilt Gespensterwald and the sea make for a pleasantly mild maritime air. The Nienhagen lies protected between the forest and the sea and offers rest and relaxation combined with fun, sports and fitness and is an ideal location for a variety of excursions.